After a short but pleasant stay in the S(h)ongolo Lounge, it was a short walk to the gate for my flight, VS (Virgin Atlantic) 602, which was being operated with an A340-600 aircraft. When I arrived at the gate, almost all passengers had boarded. This was my first flight on any Virgin airline. I was looking forward to it, but not as much as I was excited about visiting the Virgin Clubhouse in LHR (London Heathrow) and my first flight on a 787 from LHR to JFK. I was in economy. The seats are narrow and there isn’t much room between the seat in front, especially when the person in front reclines. The one saving grace was that the flight was mostly empty and there were only two passengers in my row of four seats. That made the 10 hour and 38 minute flight of 5,645 miles tolerable. My seat, 45G, is the one in the lower left-hand corner of the photo above. This section of economy only has four rows of seats so it is a little more private. The drawback is that the bathrooms are right next to the aisle seats in this section. I ended up moving to one of the open seats in my row to minimize the disturbance from people going in and out of the bathrooms and to get some extra room when the person in front of me reclined his seat. VS has a decent variety of movies. Watching some of them with noise-cancelling headsets can keep the bathroom traffic from being too annoying. Not long after takeoff, the FAs came by with drinks and then the dinner service. I had the beef bobotie dish. It was warm and tasty for economy class food. For breakfast I had the scrambled eggs. The menu described a scrambled egg dish as vegetarian. That seems wrong to me. Overall the food was good and the amount was more than adequate for the 10+ hour flight. 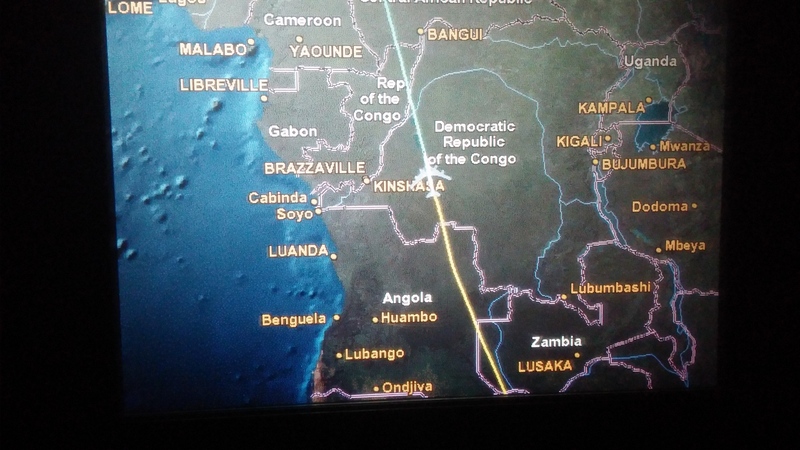 One of the nicest features on this flight was the flight following system with a very clear moving map display. The time seemed to drag by and I was very happy to get to LHR and to the Virgin Club House. This flight was torture. I am pretty good at long distance flights in economy. Normally if there is a vacant seat beside me, I don’t miss business class much. On this flight, however, the presence of two empty seats between my self and the other passenger in the row could not overcome the horrible experience of the exceedingly tight seat pitch and the proximity to the bathrooms. American Airlines is moving to a 31 inch pitch as standard in domestic economy. It seems that that will create a similarly bad experience for most even on shorter U.S. domestic routes.